The pygmy shrew (Sorex minutus) is Ireland’s smallest mammal and until very recently the only shrew species found in Ireland. Although generally thought to be one of Ireland’s native mammals, fossil and molecular data revealed that it arrived in Ireland within the last few thousand years, likely being accidentally brought to Ireland from Britain by early human settlers. It can be distinguished easily in most of Ireland by its extremely small size and weighing at most about 6g. The recently introduced greater white-toothed shrew is about three times larger. Even considering that they are both shrew species, the pygmy shrew has red-tipped teeth due to iron deposits (which act as a resistance to wear), which is lacking in the greater white-toothed shrew as its name suggests. Adult pygmy shrews are bicoloured with a brownish, thick fur which gets lighter on its flanks and underbelly. The pygmy shrew has a thick, hairy tail relative to its size. It is found in a wide variety of habitats in Ireland, particularly those rich in ground cover like hedgerows, grasslands, woodlands and peatlands. Pygmy shrews do not burrow themselves but will utilise the burrows of other animals. The diet of the species includes beetles, spiders, bugs and woodlice and it has to consume up 1.25 times its body weight each day in order to survive. This is due to its extremely small size and subsequent high metabolic rate. A period as little as two hours without food can therefore lead to starvation. Pygmy shrews do not emit audible twitters during foraging like other shrews (a primitive form of echolocation) but will produce an audible ‘chit’ when threatened or encountering another individual. The pygmy shrew is the most widely distributed shrew species found in Europe and is also the most ancient, with a fossil record dating back to the early Pliocene, between 5.3 and 3.6 million years ago. It is absent from southern Iberia and most of the Mediterranean coasts and islands. Its range extends from western Iberia and Ireland to Siberia in the east. The pygmy shrew is present throughout the British Isles and, importantly, it is the only shrew species present on the Isle of Man, Orkney, the Outer Hebrides and until very recently, Ireland also. Much of its distribution in the British Isles is owed to it being transported accidentally by ancient peoples. Its non-burrowing lifestyle likely lead to it being brought to islands in hay stooks when livestock were being transported. 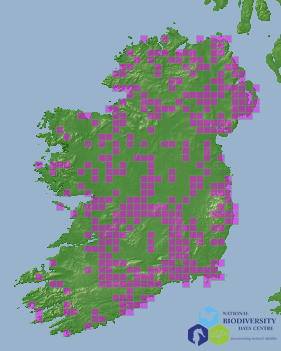 It is widespread throughout the whole island of Ireland and was found in every site sampled in a recent study of genetic variation in the species. The pygmy shrew is common throughout mainland Ireland. It has a preference for habitat rich in ground cover, which offers ideal foraging grounds and protection from predators (mainly birds of prey). These habitats include hedgerows, grasslands, woodlands and peatlands. When trapping in peatlands for instance, pygmy shrews made up almost 80% of the small mammals caught in Co. Derry during the previously mentioned genetics study. In Britain, pygmy shrews are less abundant in woodland than grassland (and are completely absent from woodland areas in northern France) but they are found equally in all suitable habitats in Ireland. They are also fond of stone walls and can be observed on these with a careful eye! Pygmy shrews spend about half of their time on the ground surface in comparison to underground. They do not burrow themselves but will make use of other small mammal runways and burrows. Their nests are usually rounded and made of dried grass. They can be underground but also under logs, rocks and dense cover. The pygmy shrew lives a solitary life except during the breeding season, when males begin to disperse in search of females. Juvenile pygmy shrews establish home ranges outside of this period and exhibit distinct territoriality to other shrews of the same species. Home range size of pygmy shrews can be between 530–1860m2. As many as 25 individuals per hectare can be found from July to December. Territory sizes of male and female pygmy shrews remain the same during the over-wintering period, but with the onset on sexual maturity, male pygmy shrews can disperse long distances in search of females, up to 80m per day. Pygmy shrews reach sexual maturity in March or April after over-wintering as juveniles. Body weight and length increase dramatically at this time. Breeding takes place between April and October with a peak occurring in June and July. Not much is known about pygmy shrew breeding behaviour but it is assumed to be similar to that of the common shrew. Females are in oestrus for approximately 24 hours at a time and courtship and mating are brief. Males mount the females and hold onto them by biting the back of the neck or top of the head. Female common shrews are known to be promiscuous and mate with several males, resulting in multiple paternity of litters. Genetic data from one pregnant female pygmy shrew and four embryos caught in Co. Waterford in August showed evidence of multiple paternity. All adult females are either pregnant or lactating up until October. Females do not generally breed until their second calendar year. The gestation period is approximately 22–25 days with litter sizes of four to six young. Females may produce up to three litters per breeding season. Pygmy shrews weigh a mere 0.25g at birth. Male pygmy shrews play no role in rearing the offspring. The duration of lactation is approximately 22 days in the pygmy shrew after which the young begin to disperse to obtain territories of their own because of aggression from their mother. The high energy demands of pygmy shrews means that they actively hunt day and night, with very short periods of rest. They move rapidly on the ground’s surface and will use their snout to probe amongst the vegetation, using a combination of smell and touch to detect prey items. They have poor eyesight, which gives rise to its Gaelic name (‘Dallóg fhraoigh’ meaning the ‘blind animal of the heather’). The pygmy shrew’s food intake is 1.25 times its body weight in captivity. This means that they may require upwards of 250 prey items per day, making them a formidable predator. They must feed every few hours or they will starve to death. Their extremely high metabolic rate is five times that of a rodent. A total of 31 different invertebrate groups were identified in the diet of pygmy shrews from a variety of habitats in Ireland. Adult beetles are the dominant prey of Irish pygmy shrews and beetles and woodlice are the dominant prey in England. Spiders, bugs and insect larvae also form a large part of their diet. The majority of the pygmy shrew’s prey items are under 10mm in length as many invertebrates are too large for the pygmy shrew to overpower. Earthworms are rarely eaten for instance. This species is protected under the Wildlife Act (1976) and Wildlife (Amendment) Act 2000 but has been listed as of ‘least concern’ in the recent Red List for terrestrial mammals in Ireland. Trapping the species without a licence is illegal. An estimate of the population size in Ireland is unknown but given how widespread it is, it would appear to be stable in most of Ireland. However, the recent introduction of the greater white-toothed shrew is a cause of concern for the status of the pygmy shrew in Ireland. The pygmy shrew has existed in isolation in Ireland from its main competitors for at least 5,000 years. Therefore, the sudden introduction of a species with both a large habitat and dietary overlap could have serious consequences for the pygmy shrew in Ireland. It is already apparent that the pygmy shrew has rapidly declined (and may be locally extinct in areas) in Co. Tipperary where the greater white-toothed shrew has become established. Further work is now ongoing to monitor and determine the competitive effects of the greater white-toothed shrew on the pygmy shrew. Carden, R.F., McDevitt, A.D., Zachos, F.E., Woodman, P.C., Rose, H., Monaghan, N.T., O’Toole, P., Campana, M.G., Bradley D.G., Edwards, C.J. (2012). Phylogeographic, ancient DNA, fossil and morphometric analyses reveal ancient and modern introductions of a large mammal: the complex case of red deer (Cervus elaphus) in Ireland. Quaternary Science Reviews 42: 74-84. McDevitt, A.D., Vega, R., Rambau, R.V., Yannic, G., Herman, J.S., Hayden T. J., Searle, J.B. (2011). Colonization of Ireland: revisiting ‘the pygmy shrew syndrome’ using mitochondrial, Y chromosomal and microsatellite markers. Heredity 107: 548-557. McDevitt, A.D., Mariani, S., Hebblewhite, M., DeCesare, N.J., Morgantini, L., Seip, D., Weckworth, B.V., Musiani, M. (2009). Survival in the Rockies of an endangered hybrid swarm from diverged caribou (Rangifer tarandus) lineages. Molecular Ecology 18: 665-679. McDevitt, A.D., Rambau, R.V., O’Brien, J., McDevitt, C.D., Hayden, T.J., Searle, J.B. (2009). Genetic variation in Irish pygmy shrews Sorex minutus (Soricomorpha: Soricidae): implications for colonization history. Biological Journal of the Linnean Society 97: 918-927. Number of young:2-3 litters per breeding season. Litter sizes of 1-9 (but mostly 4-6) born between April and October. Diet:Beetles, spiders, bugs, woodlice and insect larvae. Habitat:Habitats rich in ground cover. Found in hedgerows, grasslands, woodlands and particularly abundant in peatlands.